May I introduce: the universe. Born 13.75 billion years ago. Constantly growing. Nearly empty. Electrically neutral. Poor in antimatter. Populated by 100 billion galaxies, including 130 sextillion stars with approximately just as many planets. Consisting of only 4 percent known forms of matter. The other 96 percent is made up of 23 percent dark matter and 73 percent dark energy. The home of black holes, giant stars, pulsars, quasars, galaxy clusters, and nebulas - as well as lifeforms such as humans. With 31 images. Buyers of the ePub version may also receive for free the PDF version with additional, fascinating images that can be read on a computer (see imprint of the eBook). About the author: Matthias Matting, born 1966, is a physicist and journalist. For his eBook "Travel to Fukushima" he received the first german eBook price. In 2011, he was the official bestselling author at Amazon Germany. He's working in the science & technology department of the german news magazine FOCUS. Since five years he authors the weekly gadget review video series "Mattings Warentest" at FOCUS.de. 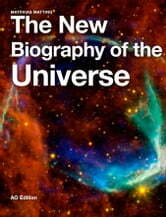 New Biography of the Univers.